1. Inferno by Dan Brown - Already read it, loved it and can't wait for the movie! Another awesome book in the Robert Langdon series. And by far my favorite... which is saying something because everyone one that came before it was my previous favorite! 2. Lean In: Women, Work, and the Will to Lead by Sheryl Sandberg - Another book I have already finished. I might actually go back and read it again so I make sure I absorb everything she says. It perfectly described the workplace for me and if I could meet just one "famous" person, it would absolutely be her. I'd love to sit down for a cup of coffee and pick her brain. LOVED this book. A must read! 3. The Rescue by Nicholas Sparks - My traveling must have for long flights is a Nicholas Sparks book. Somehow over the years, I missed this one. Now I can check it off the list! So good, just like all the other Nicholas Sparks books I am hopelessly addicted to! 4. Fifty Shades of Grey Trilogy by E L James - On my Nook already but haven't started yet. Mostly reading to see what all the fuss is about. 5. A Dog's Purpose & A Dog's Journey by W. Bruce Cameron - Recommended to me by a colleague at work.... I'm a sucker for a good book about my favorite furry people! It's calling my name from my Nook as I write this... I need more time in the day to read! 6. Young House Love by John & Sherry Petersik - Been on my list for a while. I read their blog almost everyday and haven't had a chance to sit down to read this one yet.... and again, it's already on my Nook waiting for me! If I run through those, I have this list and this list to refer to. So that's what I have so far.... any good must reads out there that I'm missing? 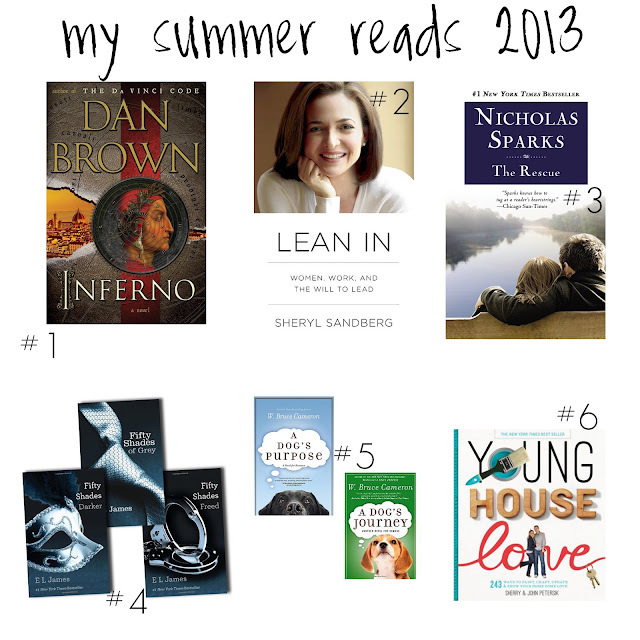 What's on your reading list for this summer? I'm in the middle of 'Wild' by Cheryl Strayed right now. Lean in and Inferno are also on my list! I haven't made enough time lately for reading, but you are inspiring me.